The Youth Play Production program is a 6 month long theatre-education program that offers youth between the ages of 12 and 16 the opportunity to learn about the foundational components of theatre and performance. This program is facilitated by Theatre; Just Because – Fort McMurray’s independent theatre company. The program features an emphasis on voice, movement, and text work built around a sustained rehearsal process aimed at building a full-length ensemble production. The primary focus of the program is instil a sense of empowerment in the youth as they embark on the journey of discovering their voice will taking ownership of the story they are telling. Every youth registered for the program receives a part in the production. If you are a youth is outside the age requirements for the program, please inquire with the Suncor Energy Centre for the Performing Arts about a possible referral. 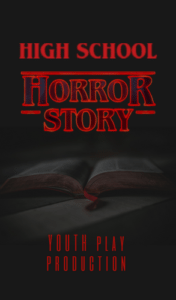 To explore the oral tradition of story-telling, Theatre; Just Because is proud to present High School Horror Story. This new play is inspired by R.L. Stein’s Goosebumps franchise, and the classic 80’s film The Breakfast Club. High School Horror Story tells the story of a group of teenagers who are partners on a science project and find themselves locked in the school afterhours on the night of a thunderstorm. To pass the time, the youths decide to tell each other scary stories to pass the time. With each story more elaborate after the other, the youth soon discover they have more in common than they realize. This family-friendly all-ages comedy is guaranteed to leave audiences with cheers and chills! The play is being written by Theatre; Just Because Artistic Director Justin Shaw, and the “horror stories” are being developed by the youth collective based on research of the youth-based horror genre, and improv exercises. “The Jock” – puts athletics first, and thinks they’re very deserving of all their accolades, even as stressful as it can be at times because of pressure from parents and peers. “The Disney Princess” – has lead a pretty sheltered life, and enjoys the bright colours and whimsy of cartoon musicals, but doesn’t enjoy when people assume their life is perfect. “The Teacher’s Pet” – this character is top of their class in grades and academics, but with few friends, they are very aware that it can be lonely at the top. “The Odd Duck” – very eccentric with their strange clothes, bizarre sense of humor, and unusual diet, but understands that being the outsider can sometimes be challenging. “The Punk” – a classroom rebel that snubs authority, keeps peers at a distance with their rude attitude, and does not want anyone to see the vulnerability beneath their façade. “The Phantoms” – the ensemble of night creatures that highlight the performative features of the grizzly stories spun by the trapped youth. *These characters are non-gender specific. Rehearsals will be spread over the course of six months. The first few weeks will be introducing the youth to basic theatre etiquette, vocal projection, stage presence/awareness, and improv exercises. From a round of auditions, Theatre; Just Because instructors Justin Shaw and T.J. Carabeo will select which youth would be appropriate for which roles, which criteria and feedback offered to each youth. From there, the rehearsals are split between rehearsing the framework of the story, and developing ‘horror story’ content through improv exercises which ultimately become scripted by Justin Shaw. Musical and vocal performance elements will then be introduced by T.J Carabeo where appropriate. In the Winter term, more production elements such as costumes, props, and set pieces are gradually incorporated in to rehearsals in anticipation for production week where the show is shared in the Suncor Energy Centre for the Performing Arts before a live audience.